If you love SPAM, you have to check out this Easy Slow Cooker SPAM Soup recipe. All you need to do is have a well-stocked pantry and SPAM! With cold winter weather here, scary icy roads mean staying home and making due with what’s on hand. That’s why you should stock up on your favorite canned goods like vegetables, different types of canned tomatoes, and your favorite type of SPAM to make this quick and easy to make soup recipe. Making this slow cooker SPAM soup recipe is also good for those times when you’re too busy or not feeling well enough to go to the store, and want to make a warm, healthy and delicious soup for you and your family. 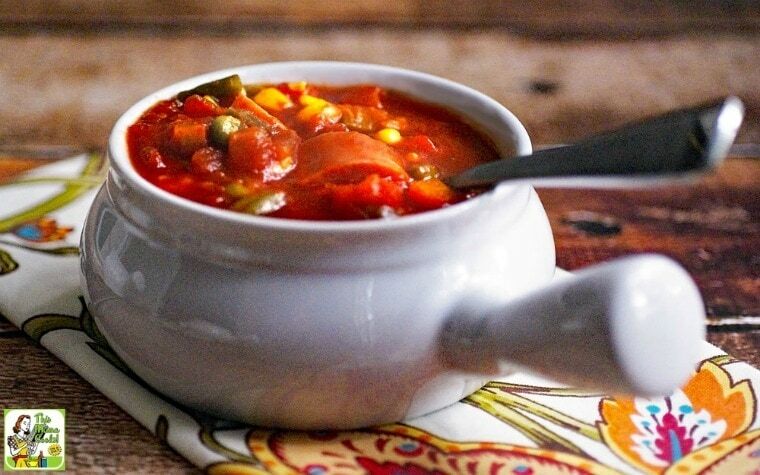 With all that in mind, I’ve created this Slow Cooker Vegetable & SPAM Soup recipe using some of my favorite canned goods from Red Gold Petite Diced Tomatoes with Green Chiles to two a new favorite I discovered after moving to the South, Glory Foods Tomatoes, Okra and Corn. Slow Cooker Vegetable & SPAM Soup is perfect to get going in the morning just after breakfast. First, open all the cans. This type of can opener makes it easy, especially if you don’t want another counter top appliance. Dice up a can of your favorite flavor of SPAM. (I like SPAM lite.) Then dump everything into your Crock-Pot, cover and turn it on. Come dinner time you have a hearty, healthy SPAM soup waiting for you in your slow cooker. You can make Easy Slow Cooker SPAM Soup on a gas stovetop or even a grill top if the electricity is out during a snowstorm, too! After going to Hawaii a few years back, my husband and I fell in love with SPAM masubi. It’s the Hawaiian version of a quick snack food that you can buy at gas station convenience stores, golf courses, and even the snack bar at the beach. It consists of a slice of grilled SPAM on top of a block of sushi rice, which is then wrapped in nori dried seaweed. So good – really! Ever since our trip to Hawaii, then we always have a few cans of SPAM lite in the house to add to eggs, ramen, stir fry, or even gluten free noodles. 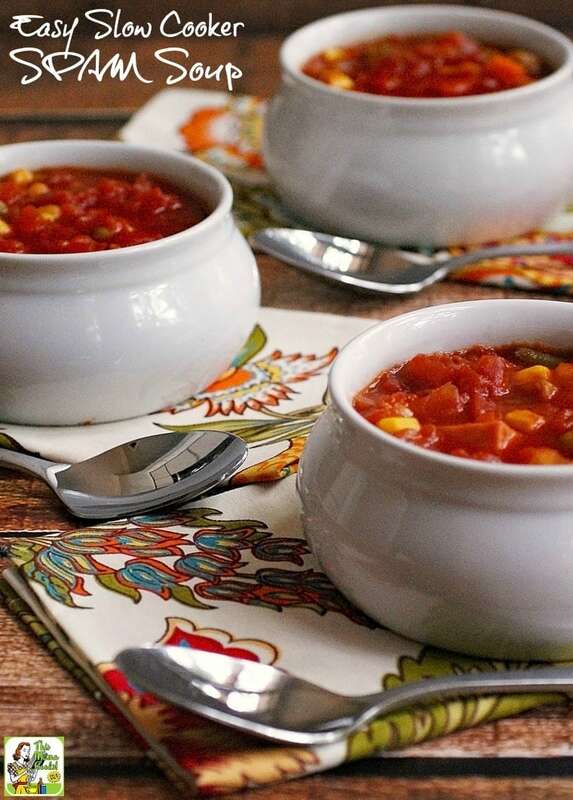 I find that having a well-stocked “cantry” helps me put more home-cooked meals on the table since I rely on canned tomatoes, tomato sauce, beans, and a variety of vegetables as the basis of so many of my recipes like Easy & Healthy Taco Soup, which can be made in a slow cooker or on the stove top. I feel good about using canned vegetables and beans since the canning process locks in foods’ freshness, flavor and nutrients at the peak of ripeness right after picking. Also, according to a University of California, Davis study, many canned fruits and vegetables have the same nutrients as their fresh or frozen counterparts. 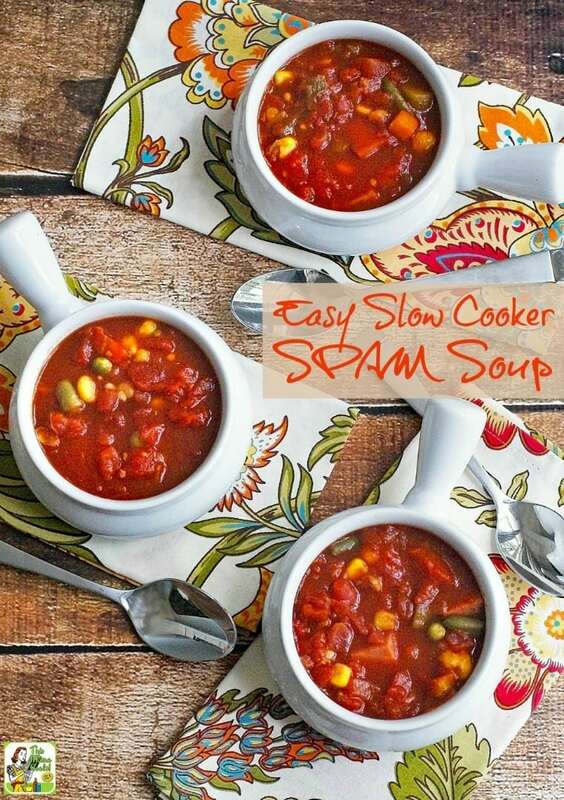 Keep an eye on sales at your local grocery store and stock up on SPAM and other canned goods for your next batch of Easy Slow Cooker SPAM Soup. Combine all ingredients except cheese and chips in slow cooker. Cook on low for 6 to 8 hours until heated through. Served with a sprinkle of shredded cheese on top and some tortilla chips on the side. Or break up the chips, and throw them right into the soup, then top with some cheese. Enjoy! Originally published on December 19, 2013. Updated with new photos and information. Posted in Gluten Free, Recipes, Soups, Veggies and tagged SPAM on December 9, 2016 by Anne-Marie Nichols. Hello ! I would walk the icy road for this great soup 🙂 Thank you for sharing and have a pleasant day ! Being from Hawaii, Spam is huge there. This is such a creative idea for a recipe. Hat’s off to you!